I went outside my usual comfort zone with my latest read and I am really glad I did. I sunk my teeth into C.J. Tudor’s debut novel The Chalk Man, and it sunk its claws into me. This multilayered novel is brilliantly plotted and introduced me to an author with a fresh voice and a easy writing style which sucked me into the book within the first few pages. Jumping between timelines, the book centers on the present day, where the main character Eddie is being forced to come to grips with a past he has tried to bury, and 1986, when Eddie and his gang of friends came face-to-face with death. The Chalk Man navigates the two timelines in a seamless, breathtaking manner that is clear and concise to the reader, never straying into extraneous details and planting many red herrings along its journey. Tudor has an eye for details and many of the breadcrumbs dropped throughout the novel pay dividends at its satisfying and well contrived dénouement. In some ways this is a coming of age novel. Eddie and his friends are your typical group of buddies basking in a summer off of school and enjoying the freedoms which come with that time off. But they soon find death visits their doorstep, both accidental and intentional. Along with a mysterious murder, chalk figures of stickmen begin to appear, pulling Eddie into a mystery much too complex for a 12-year old boy to decipher. 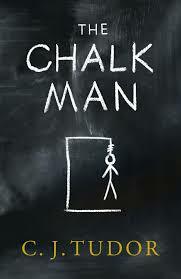 Fast forward to present day and we see the ramifications the past has had on the innocent lives forever changed by the emergence of the Chalk Man many years prior. When the chalk figures begin to reappear and the scabs of old wounds are ripped off, we see the past is never far and old secrets can be hidden away, but never forgotten. Tudor’s ability to raise suspicion in the mind of the reader and have it directed at nearly every character she has created is what sets this novel about the pack. With alternating timelines between each chapter, some books get bogged down and seem to plod through chapters which feel like information drops; but Tudor avoids this pitfall and each chapter begins with a fresh feeling and ends with a cliffhanger which has you invested in its conclusion when the story picks up again. I really dug this book and expect big things ahead for Tudor. She has crafted a very well-written debut. I am very glad I picked this one up off the strength of the blurbs on the back jacket. Readers will be well-rewarding for digging into this one.